The 7885 is simple to use, durable, accurate and reliable, and ideal for conveyor lines. 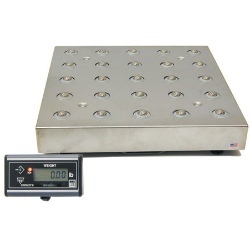 The remote display can be placed in a convenient location to allow the user to view the weight, zero the scale, or send weight data. This NTEP approved scale fits into any operation as a stand-alone scale, interfaced to a shipping manifest software, or receiving station. Remote Display Six-digit LCD display housed in an extruded enclosure with a 7 foot cable, connected via RJ 45 connector on the rear of the scale. ZERO:Includes Auto Zero Tracking or Manual push button to re-establish zero reference. TEST: Runs a diagnostic test to ensure scales is fully functional, and allows a real-time view of internal settings. Construction Stainless steel weight platter, powder painted 7 gauge steel weigh bridge and base plate. Field Calibration Alternate span points can simplify field calibration by using less than full capacity weights. Can be set-up as either decimal pound or kilogram. RS-232 cable Included with each scale, DB 9-pin, null modem, female connector allows you to connect to a PC. Emulation Protocols Standard NCI default with field configurable settings of 8213, 3835, SMA, and Auto Weight Send. This allows you to select compatible scale communication settings or scale drivers during field installation when interfacing with shipping software programs or host devices. Internal Resolution: 1 part in 120,000. Dimensions: 18.0” x 18.0” x 3.0” (457mm x 457mm x 76mm). Power:120 VAC (+10% -15%), 60 Hz, standard 3-wire ground. Canada: Canada Weights and Measures approval pending. Input/Output: RS-232, bi-directional, configurable 1200 - 19.2K baud. Transmits weight and scale status whenever ASCII “W” is sent by a remote device. Shipping Weight: 47 lbs/22 kg, standard configuration. RS232 10' Interface cable (9 pin to 9 pin) included with each scale. Remote display includes a 7' cable. *Custom or non-stock item. Please allow 5-day lead time. Orders for 6 or more, call for delivery schedule.